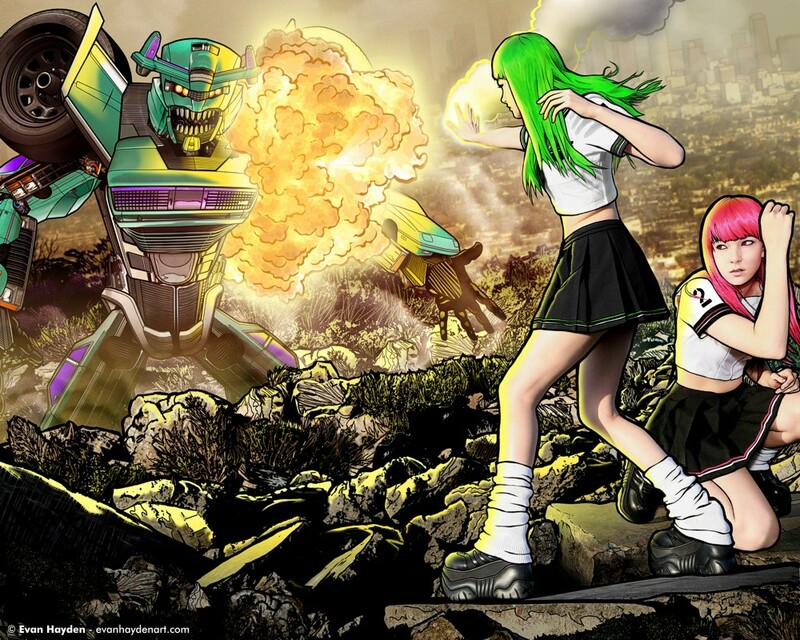 In the midst of an epic battle, twin psychic school girls deal a decisive blow upon a towering giant robot. Pretty much my magnum opus thus far... It's the third in my giant robot series, but there's more to it than just that. From my middle school days until the early days of college, I was a huge anime nerd. I also read a ton of manga. These two mediums have had a profound effect on my art style, techniques, and favorite themes to this day. Though I am still being a big manga fan, I don't watch much anime anymore. I got sort of burned-out, and didn't feel like I was seeing enough variety in the modern-day anime (with the exceptions of auteurs such as Satoshi Kon, Mamoru Oshii, and Katsuhiro Otomo). Despite the disaffection with modern anime, I still have a strong love of the stuff I grew up on, tracing back to being a 4 year old and watching Robotech with my older brother. That had a profound effect on me. In this piece, I pay tribute to that, as well as Mai the Psychic Girl, Gundam, Domu, Project A-Ko, Cutey Honey, and other bits and bobs of Japanese pop culture that I grew up with, as well as a little dose of Transformers. Basically as you can see, giant robots and psychic battles are two of my favorite subject matters!